Ideal for inspecting highly reflective parts. Polarizer helps reduce glare when viewing shiny parts. 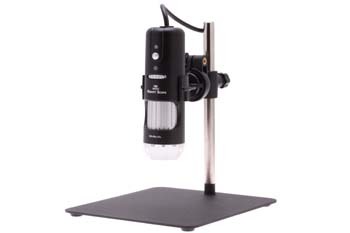 Convenient and sophisticated, Aven's Mighty Scope 5M USB Digital Microscope features a plug-and-play USB interface for an easy computer link, as well as adjustable magnification, image and video capture, a large working distance, and a broad magnification range of 10x to 50x magnification, and up to 200x digital zoom. Experience reduced fatigue and increased productivity by viewing clear magnifications on a monitor rather than hunching over traditional microscope eyepieces. The powerful scope also includes dimmable illumination an adjustable stand at no extra cost, as well as advanced software for image capture, annotation and measurement, freeze frame, and compare mode, making it an essential tool for engineers, scientists, doctors, lab techs, forensic examiners, educators, and more.